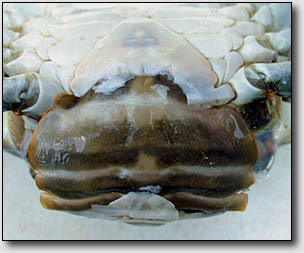 Recently molted, post-buckram, crabs have shells with a grayish cast on their topsides and lustrous white abdomens. 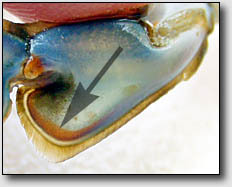 Later in the intermolt period, crab abdomens take on the glazed and slightly stained look of aging horses' teeth; often they are also spotted with "rust." Click here for images. As a crab nears the end of its intermolt period, a smart waterman will see the tell-tale signs that its molt is near and will place the crab in a special shedding tank until it molts. These signs are the "white sign", "pink sign" and "red sign". larger than a fingernail clipping, on the second segment of the swimming fin. Sequence left to right: mid-cycle, white sign, pink sign, red sign. White Sign - Also known as snots or greens. 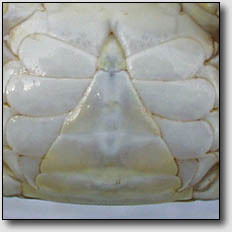 The white sign is simply the first faint outline of the second exoskeleton or new skin forming underneath the old as molting approaches. It is very hard for laymen to distinguish. It usually appears about two weeks prior to molting. Pink Sign - A pink mark that appears on the crab's backfin which indicates that it will molt in less than a week. This marks the appearance of the new shell underneath its present hard shell. Red Sign - Hard crab which will molt in less than two days. Amateurs can usually detect the red sign, but with considerable practice. 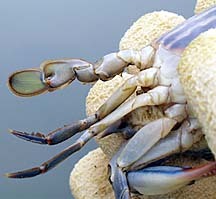 Rank Peeler - Hard crab which will molt in a matter of hours. 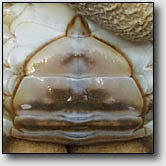 If you squeeze (or pinch) the end of a rank peeler's swimming fin, the new soft shell underneath will be displaced as seen in this image. Be sure to massage the fin back to its original position or the crab will "hang up" when it molts, meaning that it will not be able to back out of its old shell completely, leaving its new swimming fin behind. 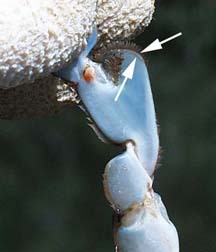 The female blue crab has one additional sign which appears when an immature female crab, or "Sally," is about to perform her final pre-pubescent molt and become sexually mature, thus becoming a "Sook." Simply examine her abdomen and note the color of her apron. A red-sign Sally will have a dark, purple colored, abdomen. See images below. The reason this occurs is very apparent when you actually see the female busting out of her old shell. The sook's new bell-shaped abdomen is dark in color and is what you're actually seeing through the shell of the red-sign sally. 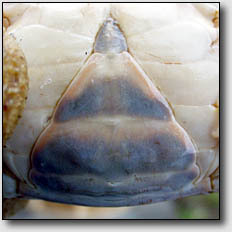 In the image below-left, note that her old shell has a "V" shaped abdomen while her new abdomen is "U" shaped. The image below-right shows her as a sexually mature adult, or sook. When finished, she will be a sook.